Nassim Nicholas Taleb, in his insightful books, explains that most of us think we live in a world dominated by averages and normal distributions, when in fact the things that matter most are those governed by "scalable" or power distributions. One of his examples is the turkey, who lives every day of his life happily roaming the farm, pecking on corn, getting his fill, being treated nicely by the farmer, and goes to sleep each night knowing that the next morning will be just like the last. Until one day the friendly farmer picks him up, carries him to the back yard, chops off his head, and throws him in the oven. This kind of "black swan" event happened to the economic system in 2008. I was recently at a "risk in the post-collapse era" symposium, where highly paid risk officers were touting their stress tests and hedging strategies. Everyone in the room seemed to think we recently learned our lesson and that's never going to happen again. I was shaking my head. Everything is still correlated, still connected in an impossibly complex web that no person and no software can understand. Complicated cooperative systems that rely on many parts are prone to systemic failure. Regulation of the financial markets, while well intentioned, has failed us in the past and will fail us again. Every day, millions of people around the world remove their shoes to clear security at the airport - not because one idiot put some explosives in his shoes and was caught trying to light them on fire ten years ago, but because of our inappropriate reactions to things like that. Legislators think they can prevent bad things from happening in the future by passing bills that focus on what happened in the past. The United States of America holds the world record on gun violence, people in prison, corporate profits with few employees, influence of press and advertising, failing education, expensive and inefficient health care, and economic inequality. These things are related. They are all part of a system that is prone to catastrophic failure. Another way to look at this is that the distributions on the left side are fairly easy to model, while the upper-right quadrant includes "known unknowns," and the lower right quadrant - the black-swan domain - includes "unknown unknowns." According to Taleb, if you pay 10% attention to everything in the other three domains and give 90% of your attention to the black-swan domain, you will likely be better off than the other way around. 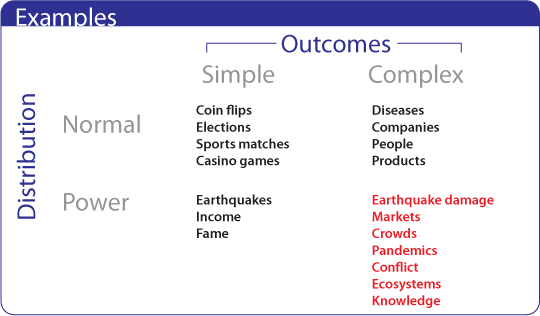 Before building models and making predictions, you must know which quadrant you're in and what the impact of unlikely events could be. The black-swan domain is beyond the limits of statistics. Applying even sophisticated statistical techniques to "predict" the likelihood of black-swan events is how people get in trouble. There are ways to address black-swan events, but you can't build them into your models, because models of the future are almost always built on data from the past. Even today's "stress tests" are too limited to apply to the real world. The old ways of modeling and predicting the future won't work. Today we use statistical models that include many different kinds of "outlier" possibilities and build Monte-Carlo-type simulations that have randomness built-in. We use a common language of probability distributions, rather than predictions. And we build portfolios that are properly hedged against unforeseen events. According to the few companies that do this kind of work, most organizations are in the stone age when it comes to identifying and managing real risk.